Definition at line 303 of file llinventoryview.h. Definition at line 306 of file llinventoryview.h. Definition at line 307 of file llinventoryview.h. Definition at line 311 of file llinventoryview.h. Definition at line 416 of file llinventoryview.cpp. 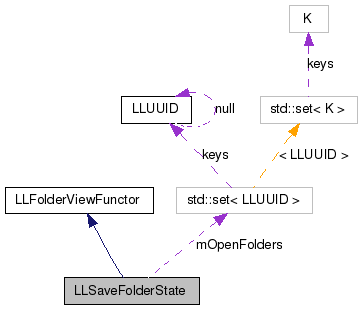 References FALSE, LLFolderViewItem::getListener(), LLInvFVBridge::getUUID(), LLFolderViewFolder::isOpen(), LLFolderViewItem::isSelected(), mApply, mOpenFolders, LLFolderViewFolder::setOpen(), and TRUE. Definition at line 309 of file llinventoryview.h. Definition at line 406 of file llinventoryview.cpp. Referenced by LLInventoryView::init(), LLFloaterLandmark::LLFloaterLandmark(), LLFloaterTexturePicker::LLFloaterTexturePicker(), LLInventoryView::onClose(), LLFloaterTexturePicker::onSearchEdit(), and LLFloaterLandmark::onSearchEdit(). Definition at line 314 of file llinventoryview.h. Referenced by doFolder(), and setApply(). Definition at line 313 of file llinventoryview.h. Referenced by clearOpenFolders(), and doFolder().